For Skye Rayburn, putting in blood, sweat and tears is simply part of the process. 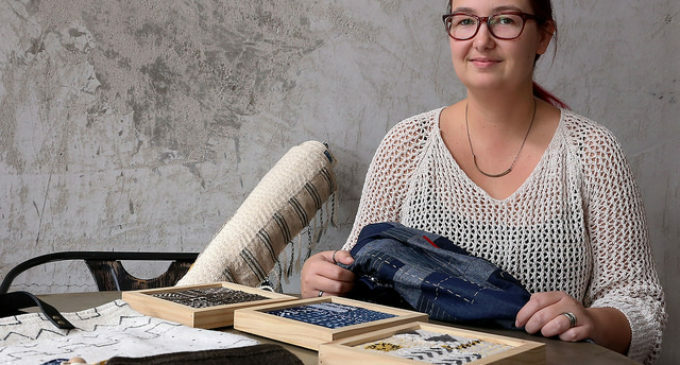 Construction, cutting, pressing and stitching are key elements that go into the quilts, totes and wall art she produces as the creator of Isle of Skye Studio. In her hands, they go from fabric to masterpiece. Rayburn, a UNT alumna, decided to put her love of textiles to action and made her first quilt in 2011 using one of artist Sonia Delauney’s color studies as inspiration. Rayburn picked it back up in 2015 and began Isle of Skye Studio the following year. The time frame for how long a quilt will take varies widely, from a few weeks to a few months — depending on the method of stitching that is used — but Rayburn enjoys the complexities of the task. The primary stage of making a quilt is the part Rayburn enjoys the most. Rayburn prefers to use natural fibers like linen and muslin in her creations because they have a better feel and are not hot to the touch like other fibers. As a fan of textural fibers, denim is one that she particularly enjoys using. The intricate stitch work that is involved, paired with the geometric patterns she uses, make Rayburn’s quilts easily double as art pieces, which is something she strives for. During her time at UNT, Rayburn started out as a double major in fashion design and fibers but dropped fibers to focus on fashion design after finding it difficult to juggle projects for both majors. The fashion design taught her what she feels is a very valuable skill: how to construct a garment. Though her time as a fibers major was brief, Rayburn still believes the fibers program, which has recently been shut down at the university, is a significant part of fashion. With her experience and education in the art, Rayburn has met a wide range of people in the community. 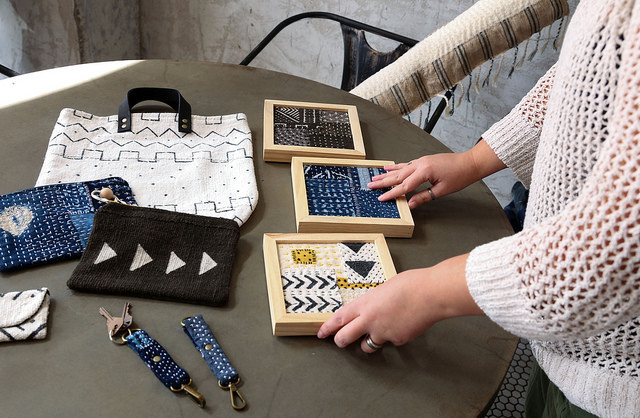 Lora O’Shaughnessy, a friend of Rayburn’s and owner of Egan Street Designs, met Rayburn in summer 2017 when they brought their work to the same market. Kara Herman, an embroiderer and another friend of Rayburn’s, respects the precision in Rayburn’s quilt making and the Japanese style of embroidery she does. Herman said she enjoys being able to watch Rayburn work and admires what she does through the lens of a fellow embroiderer. Rayburn also recently participated in a market for the Women’s Conference in Argyle, a new experience for her. To Rayburn, quilting requires time and investment, from designing the quilt down to binding off and labeling it when it is finished.